Ea O Ka Aina: Too many fish in the sea? Too many fish in the sea? SUBHEAD: Fukushima radiation will cause long-term harm to Pacific Bluefin Tuna and Pacific Pink Salmon. 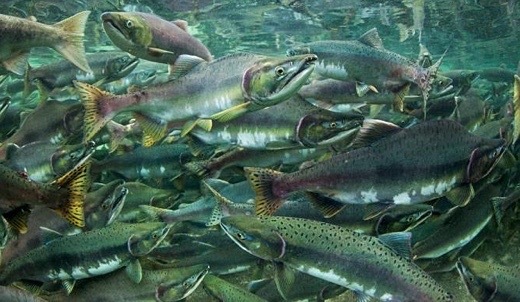 Image above: Pink salmon, shown spawning in Alaska, have increased since the 1970s, with an estimated 640 million returning to their breeding rivers in Asia and North America in 2009 alone. Now the species population is in collapse. In the long run, are the Fukushima meltdowns going to conserve or destroy fish in the Pacific Ocean? From (http://news.nationalgeographic.com/news/2014/03/140331-salmon-seabirds-pacific-fish-animals-science/). Analysis of the results shows that the Pacific Bluefin Tuna will experience a steeper population decline in the short term compared to its expected population decline… after which the population will return to the expected population. The authors are thankful to [National Science Foundation award] NSF HRD-0902132 (LSAMP) for the support to do this research. TPP Fast Track set for Friday?